Yes, I truly do have a clematis actually blooming in Seattle in February! 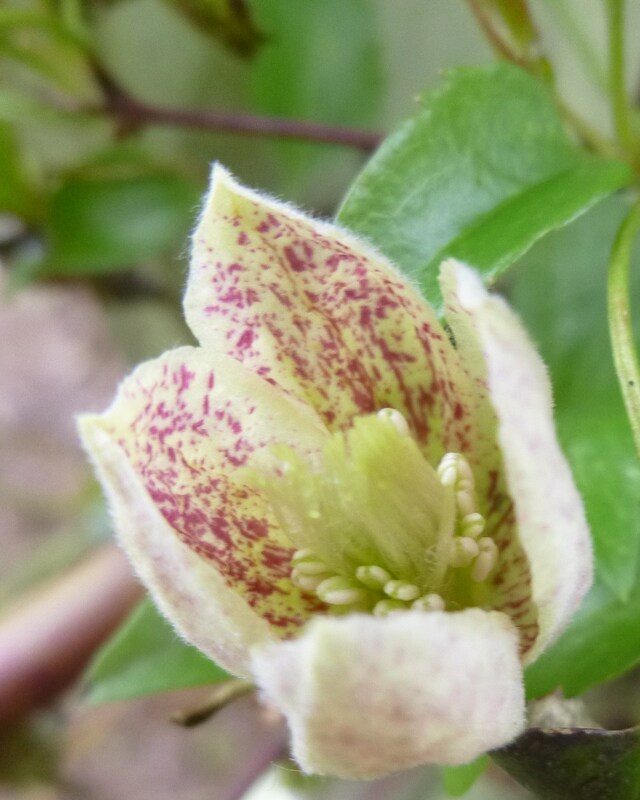 Clematis cirrhosa var purpurascens ‘Freckles’ (that’s its full name–really, it is!) is presently gracing my garden with blooms, well, one anyway. The blossom I gleefully discovered two days ago was found only because I leaned half over the deck checking out my vines hoping against hope for a bloom. Then–aHA–I saw one! And almost killed myself in my excitement by leaning just a tad too far over the deck rail before I came to my senses. Alas, today when I wanted to photograph it for posterity, it had already shriveled. Nearby buddies were still only small white buds. I certainly didn’t want to disappoint readers, especially Ingrid in Sweden, who were hankering to see a clematis actually blooming now in a garden real time. So, this morning I hunted around and right on the deck in easy reach of the camera, what to my wondering eyes should appear, but a lovely single bloom. The fresh-looking crisp foliage of this clematis is dainty, apple-green, and deeply divided, almost fernlike. Even when it’s not blooming it adds welcome green accents to the winter garden. The down-side is that this clematis, and all its Clematis cirrhosa cousins, are tender, being natives of the Mediterranean, from southern Spain and northern Africa to Syria. Luckily, here in Seattle, we can grow them easily. This particular clematis was raised from seed collected on Mallorca (an island in the Mediterranean Sea) by Allen Peterson, curator of the Chelsea Physic Garden in the 1980s. Well-known clematis nurseryman, Raymond Evison, received seeds from Peterson and introduced one of the resulting seedlings as Freckles in honor the freckled face of one of his daughters. 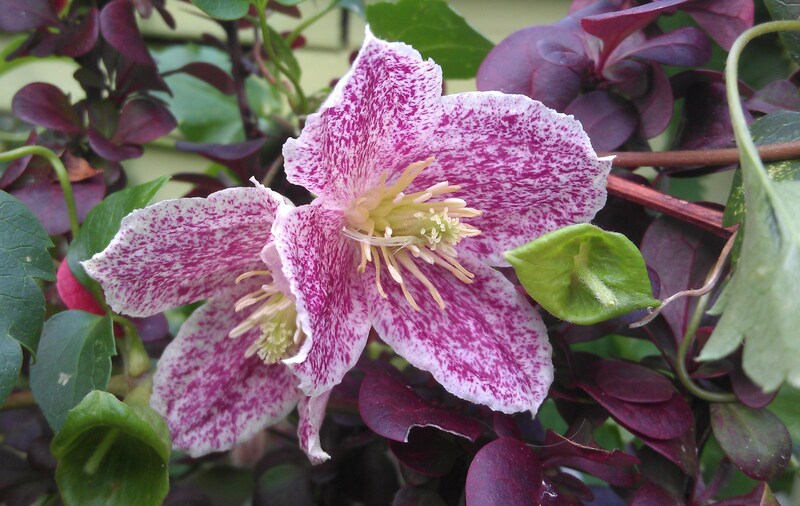 A sun-loving vine that can grow 12 – 15′, Clematis Freckles is expected to bloom betweeen October and February. My particular plant is confused–or maybe just a rebel. This year it bloomed with strong red freckles in July with my burgundy Barberry ‘Helmut’s Pillar’ and the chartreuse flowers of Bells of Ireland — then again now in very late February with a pallid flower, whose wan look is due I presume to the short gray days we’ve had, which lacked enough sun to bring out strong color. If you have one, let us know how yours behaves (or misbehaves).